Overture Domain is an age-restricted apartment community in Austin, Texas that allows active adults to live a maintenance-free lifestyle. With the well-appointed apartment homes at this 55+ community, residents can live a modern lifestyle in a close-knit community of like-minded individuals. The activities, social gatherings, and amenities offered here create an environment that provides residents with everything they need to live healthy and engaging lives, whether they want to relax poolside, host parties with friends, or take a group trip to a ballgame. The community's location on the north side of the city connects residents to plenty of choices for entertainment, dining, and shopping. 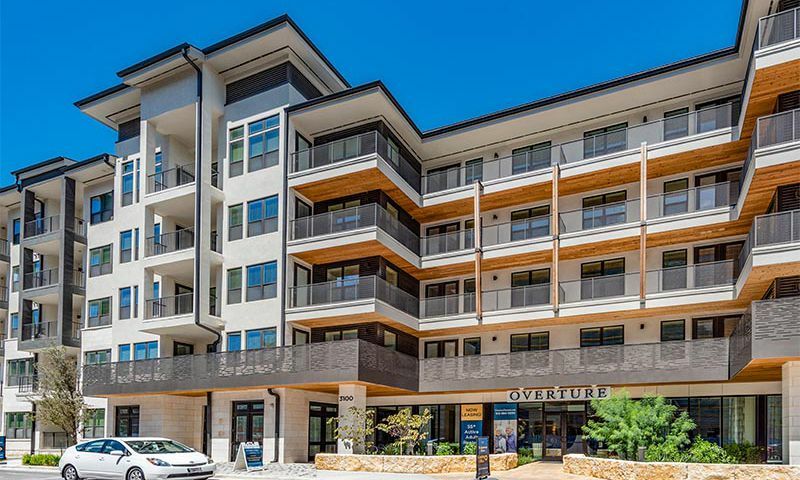 Overture Domain is just waiting to be discovered by active adults looking for apartments for rent in an age-restricted neighborhood in Austin, Texas. With 12,000 square feet reserved for amenities, Overture Domain provides plenty of space for residents to gather, meet with friends, and enjoy everything this community has to offer. This rental apartment community made sure to include amenities on-par with those found at many active adult communities. Residents at Overture Domain have access to a large dining area and a private dining room. The dining area is an ideal space for a sit-down meal, while the private dining room can host smaller gatherings of friends. The dining room doubles as a meeting room with ample space for get-togethers and activities. The demonstration kitchen can host cooking classes where residents can learn how to make new cuisines. A theatre, library, and game room round out the amenities with even more opportunities for residents to meet neighbors with similar interests and expand their social circles. A fitness center and yoga studio, which offers regular classes, round out the indoor amenities found throughout this community. Outdoors, the amenities continue with a swimming pool and hot tub ideal for sunbathing in the pleasant Texas climate. A barbecue grill and outdoor courtyard also await. Residents with furry friends will appreciate the dog park and dog wash both located in the community. Overture Domain features 201 apartment homes that range between 698 and 1,347 square feet. These one-bedroom and two-bedroom residences are designed with wood-style plank flooring and ten-foot ceilings. Kitchens come complete with granite countertops, wood cabinetry, stainless steel appliances, and French-door refrigerators. Each bedroom features plush carpeting, a ceiling fan, and walk-in closets. The bathrooms include garden tubs and showers, dual vanities, medicine cabinets, and linen closets. Each unit also comes with a full-size top load washer and dryer. Residents at Overture Domain live in a community that supports active adult lifestyles with an exciting offering of lifestyle clubs and events. Regular fitness classes that include water aerobics, Tai Chi, and Zumba provide ample opportunities for residents to stay active in a social setting. Wii fitness training offers another fun opportunity for fitness. Residents who love the demonstration kitchen will love the experience of taking cooking classes with friends. Then, they can take part in one of the many potluck dinners that pops up on the social calendar. Other events throughout the year include movie nights, game nights, and holiday parties. Popular social gatherings include book club and crafting events. The community even schedules off-site sporting events and day trips so friends and neighbors can explore the area together. Overture Domain is located on the north side of Austin, Texas close to the Mopac Expressway. With such a convenient location in Austin, residents can easily drive to San Antonio or Houston to experience the culture of the cities. There are also plenty of entertainment and dining options nearby that residents can access by car or public transportation. To make sure residents can enjoy the area, the community partners with Lyft. Because the community is located in the heart of The Domain shopping center, residents can easily walk to Dillard's, Macy's, Neiman Marcus, Restoration Hardware, and the IPIC movie theaters. There are plenty of grocery stores and shopping centers just down the road, including Whole Foods Market, Sprouts Farmers Market, and Walgreens. The nearby food options include Urban American Grill, North, Gloria’s Latin Cuisine, Maggiano’s Little Italy, Punch Bowl Social Austin, and Flaming Pizza. When residents need health care, the community is just a couple miles from several healthcare options, including Seton Northwest Hospital. Golfers can work on their swing and play a virtual game at the nearby Topgolf. Those looking for a night out can see the latest movies at Regal Cinemas Gateway 16. There are plenty of activities available in Overture Domain. Here is a sample of some of the clubs, activities and classes offered here. Overture Domain consists of 201 apartment homes that range between 698 and 1,347 square feet. The one-bedroom and two-bedroom residences feature wood-style plank flooring and ten-foot ceilings. Want to learn more about Overture Domain?